We are currently meeting with stakeholders throughout the State to gather input on the current Statewide Preservation Plan, which will be completed by 2020. Keep checking back here for updates! You may also receive periodic updates by following and subsrcibing to our blog. 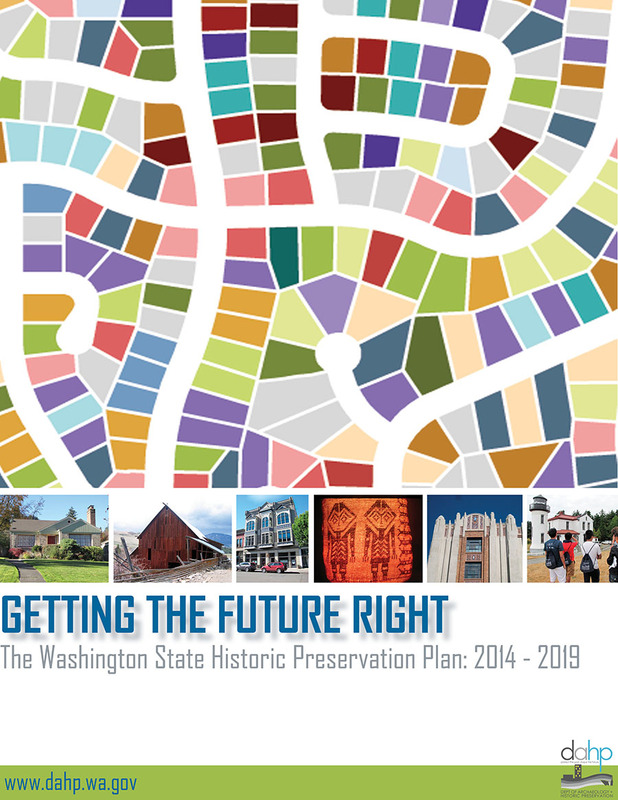 The Department of Archaeology and Historic Preservation (DAHP) has released its Washington State Historic Preservation Plan 2014-19: Getting the Future Right for public review and comment. The 59 page document represents the culmination of eight months of meetings, presentations, and stakeholder input on goals for the state’s historic preservation community to achieve during the five-year planning cycle. Getting the Future Right has three goals each with a series of supportive strategies and tasks. The plan also identifies key players for implementation plus associated products and timeframes. Also in the plan for review is a description of the planning public participation process, an assessment of the status of the Washington State Inventory of Cultural Resources, and statewide trends affect preservation work. DAHP is required to produce and help implement a state historic preservation plan on a five year cycle as a result of provisions in the National Historic Preservation Act of 1966. At this time, it is important to recognize and thank the many participants who have worked to bring the plan. The Preservation Plan Steering Committee has truly led the planning process and its content. All members have fully participated in committee meetings; reviewed and commented on drafts; and have generously shared their expertise and insights on historic preservation work in Washington. Natasha Fedo of BERK Associates together with Teresa Brum of Brum and Associates have been instrumental throughout the planning process, managing all aspects from drafting text to public participation. Also crucial to shaping the plan has been State Historic Preservation Officer Allyson Brooks and DAHP staff who reviewed, commented, and provided valuable insights. Please see a complete list of Steering Committee members and DAHP staff in the plan. Finally, everyone who has provided comment at meetings, workshops, or the on-line survey are thanked for participating and sharing your valuable time. Questions on the plan can be directed to Greg Griffith at greg.griffith@dahp.wa.gov or calling 360-586-3073 or mailed to DAHP at POB 48343, Olympia WA 98504-8343.